The Toyota MZFE engine is a transversely-mounted, timing-belt driven, 24-valve, dual overhead cam (DOHC) aluminum V6 design. It is used in many Toyota and Lexus cars from 1994 to 2003, including the Lexus ES300 and RX300, and the Toyota Camry, Avalon, and Solara. It comes in a 3.0 liter version, the 1MZFE, and a 3.3 liter version, the 3MZFE. Most engine components in the 1MZFE are interchangeable with the 3MZFE, including the timing belt, tensioner pulley, and guide pulley, although the 3MZFE has a different tensioner configuration. See my other article for replacement of a timing belt on the four-cylinder Camry (the 5SFE engine). If you noticed oil leakage from the firewall side valve cover gasket, I have another article on how to replace the gasket on this engine in an Lexus ES300 which uses the same engine. In models before the 1999-2003 introduction of VVTI (Variable Valve Timing) technology, the engine's valve train is “non-interference,” meaning that if the timing belt breaks while the vehicle is operating, it will not necessarily damage the valves or pistons. Therefore, you can use the instructions below to replace a broken timing belt on a non-VVTI engine. Positioning the camshaft sprockets and the crankshaft pulley alignment marks to Top Dead Center (TDC) is all you need to do before installing the new belt. After installing the belt, you can do a compression leakage test to make sure the valves are still okay. Toyota recommends belt replacement after 90,000 miles. Other parts are often replaced at the same time. Some shops always replace the water pump with the belt, but in my experience the Aisin water pumps that come with the MZFE Camry are good for at least 200,000 miles. 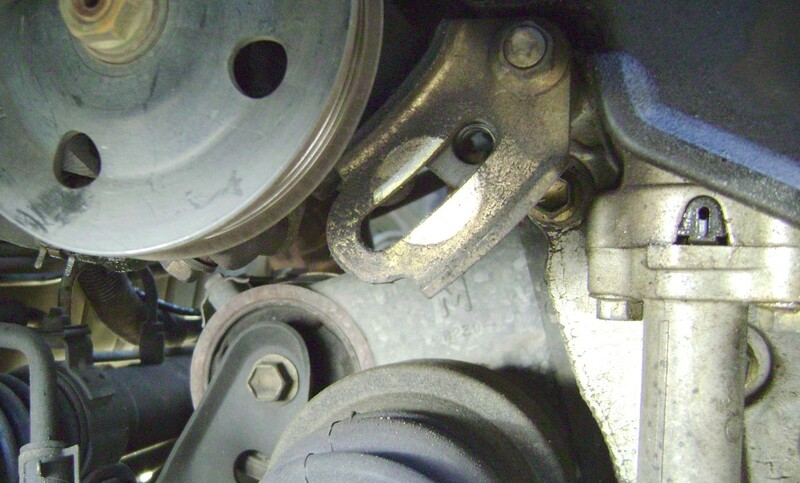 At 150,000 miles, some guide pulleys (idler pulleys) and tensioner pulleys look worn and need replacement. The tensioner (actuator) doesn't generally need replacing. After 200,000 miles, I would definitely replace the seals (camshaft, crankshaft, and oil pump) and the water pump as well, along with the timing belt. Whether or not you need to replace the seals depends on their mileage, age, and their observed condition after you remove the timing belt cover. On the four-cylinder 5SFE Camry these seals do start to leak at about 150K, but on the V6 MZFE they last longer. Using a "high mileage" oil may swell the seals and stop leakage for a while, though eventually (certainly after ten years) seals turn brittle and this trick won't work. Allow three or more hours to replace the belt alone. 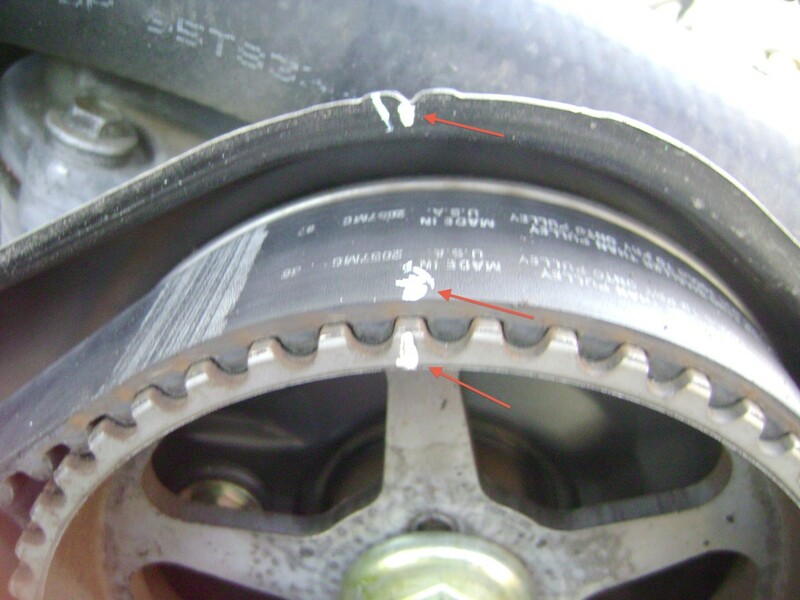 Reminder: marking the old belt with paint where it meets the crankshaft and camshaft pulleys, and transfering these marks to the new belt, will make it much easier to install the belt if any of the pulleys happen to move between the removal of the old belt and the installation of the new one. High mass impact socket like this one (if encountering difficultly removing the crankshaft pulley bolt with a powered impact driver). Pulley removal tool like this one (if encountering difficultly removing the crankshaft pulley). Japanese cars use the following metric sizes: 10mm, 12mm, 14mm, 17mm, 19mm, 21mm, 22mm. At a minimum, to remove and torque screws and bolts, especially the crankshaft bolt discussed below, you will want a breaker bar. This is a tool of many uses. The next step up is an impact driver. You can get a manual impact driver, but an electric impact driver is even better, if you can afford it. The one below is the best I have used. The cost of the belt and components can vary greatly. If you want to use Japanese OEM (Original Equipment Manufacturer) parts--the parts that Toyota puts its own label on--you will want a Mitsuboshi timing belt, Koyo pulleys, and an Aisin water pump. Other Japanese OEM brands include Denso, NGK, KYB, Akebono, GMB, and Sumoto. Shop and compare prices, including shipping costs, for the best deals. Basically, any Fortune 1000 parts company should provide adequate parts. 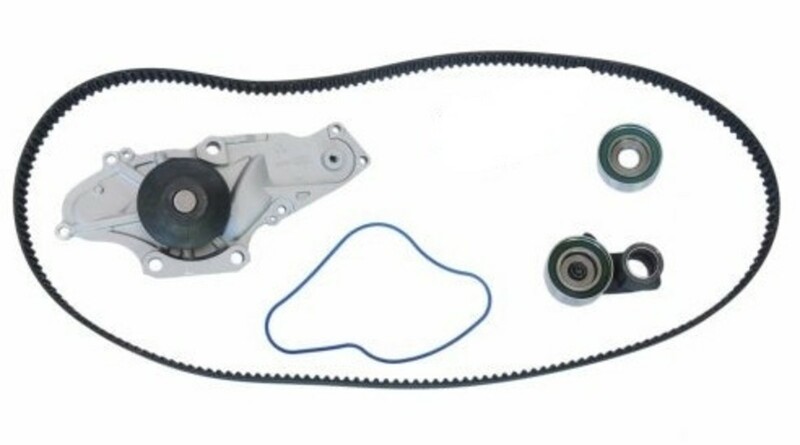 This timing belt kit has parts from OEM Toyota parts manufacturers. The water pump is from Aisin, the timing belt from Mitsuboshi or Gates, and the rest from reputable OEM vendors. In my experience, Aisin makes the best and longest-lasting water pumps for this engine. The camshaft and crankshaft seals, if you intend to replace them, must be bought separately. *Note: The 3.0L 1MZFE uses a different hydraulic tensioner than the 3.3L 3MZFE. 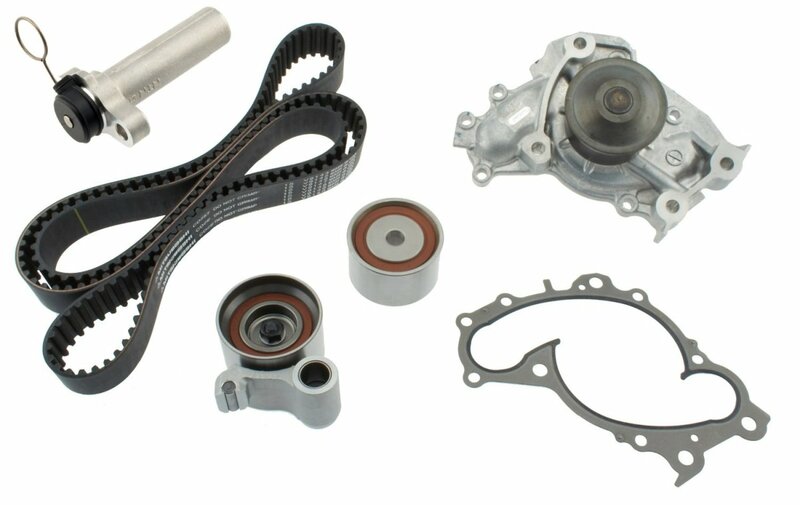 This timing belt component kit includes a water pump is from Aisin, a timing belt from Mitsuboshi, bearings from GMB. and the rest from reputable OEM vendors. In my experience, Aisin makes the best and longest lasting water pumps for this engine. *Note: The 3.3L 3MZFE uses a different hydraulic tensioner than the 3.0L 1MZFE. This video, the first stage of my "redo" or makeover project on a Lexus ES300 (3rd Generation), will show you, step-by-step, how to replace the timing belt, water pump, idler pulley, tensioner pulley, cam and crank seals. On this car, which has over 160K miles, the timing belt has slipped, the water pump and pulleys have seized, and many parts are either worn out or in need of replacement. The steps in this video will work on other cars with the V6 1MZFE engine, such as the Camry V6, Solara V6, Highlander V6, Sienna, Avalon, and Lexus RX300. The 1MZFE engine, of course, is a non-VVTI engine, so a broken timing belt can be replaced with a new belt without any concern that the broken belt has bent the valves. The video contains the procedures described in the text below, though it has some of the steps in a different order. The video gives more detail than is in the text about replacing the water pump, crankshaft seal, and cam seals. This timing belt replacement video is basically the same as the ES300 1MZFE engine but for the Sienna's 3.3L 3MZFE engine. The major difference is the redesign of the belt tensioner pulley bracket. This timing belt replacement video is for a Camry with the 3MZFE engine. Again, the major difference is the redesign of the belt tensioner pulley bracket. Letters refer to photos at the end of this section. Click on a photo to enlarge it. Place transmission in "park," apply the parking brake, and chock the rear wheels. Support the vehicle on a jack stand and remove the passenger-side front wheel. Unbolt the front fender apron seal on the passenger side (A). 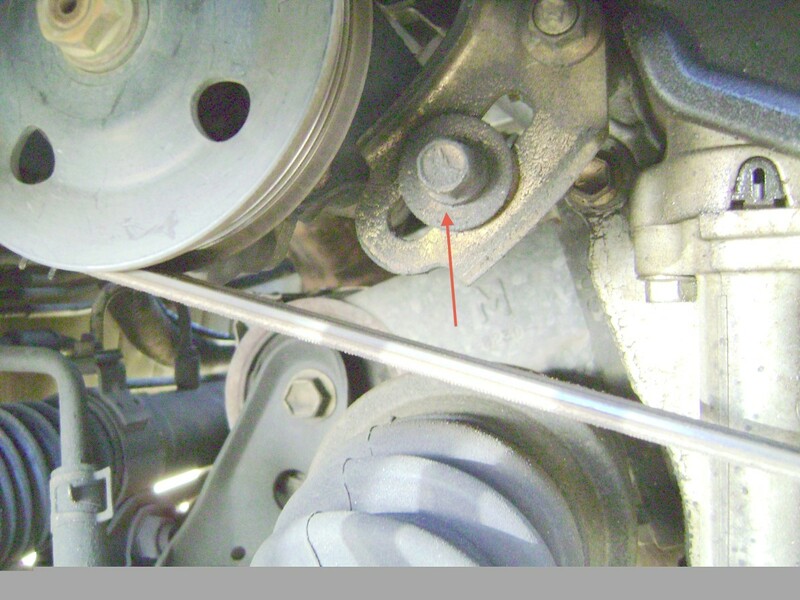 Loosen the crankshaft pulley bolt (B). If you don't have an impact driver, use a breaker bar (C) secured to the ground or frame of the car (D). "Thump" the ignition (run it briefly) for around one second. 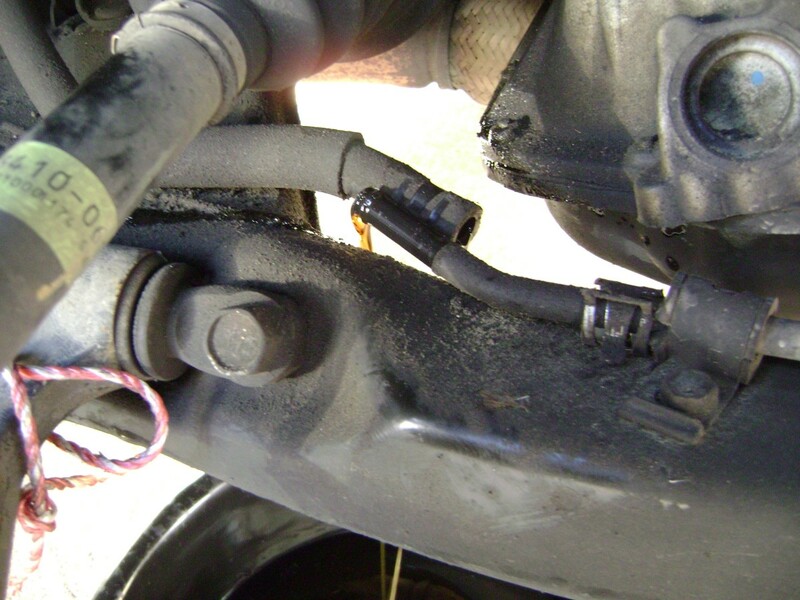 The torque from the starter motor should relieve the tension on the bolt. If that desn't work, it's possible your car's battery is too weak to provide enough amps to loosen the bolt; you can try jumping the battery with another car’s battery. If that doesn't work, applying heat to the bolt from a propane torch can help ... but be careful ... too much heat will damage the oil seal. As a last resort, find a friendly garage owner who'll torque the bolt off for you with their 180-lb air-powered impact driver. Turn the engine clockwise (E) to align the crankshaft pulley to the Top-Dead-Center (TDC) mark on the timing belt cover (F). (See video at about 3:45.) 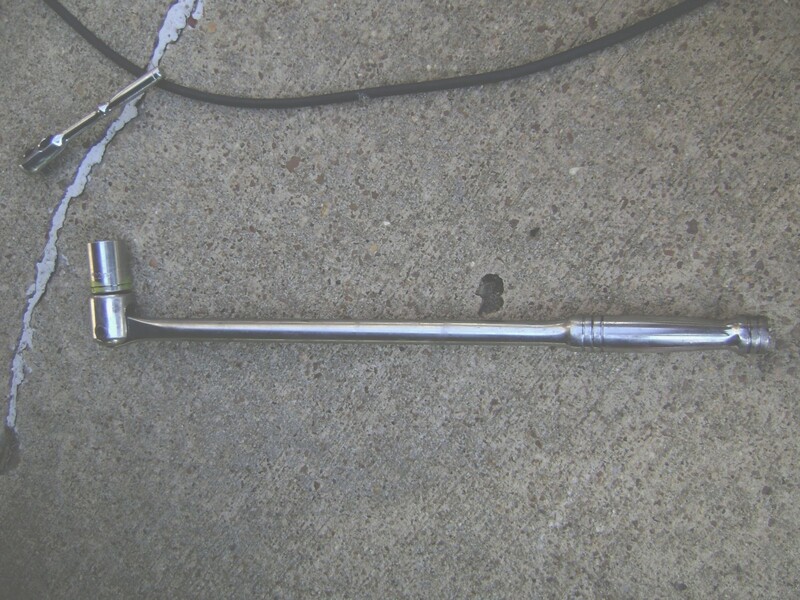 Use a 1/2" drive socket wrench attached to the (loosened) pulley bolt to ease engine rotation. Use an impact driver, or do a quick twist of the socket wrench counter-clockwise, to spin off the crankshaft pulley without upsetting the alignment. (Optional:) If your power steering fluid has turned black, it's convenient to replace it as part of this job; you can drain it from the power steering pump hose, instead of from the reservoir. 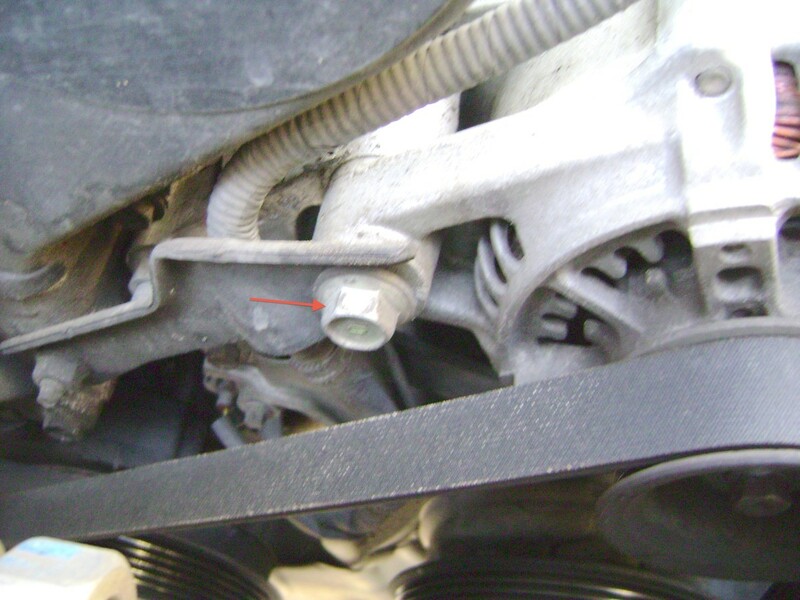 Remove the hose clamp and hose from the metal tube located below the crankshaft pulley (G). You can "push" out most of the fluid by turning the steering wheel left and right while the fluid is draining out. When completely drained, reconnect the hose and clamp (H). 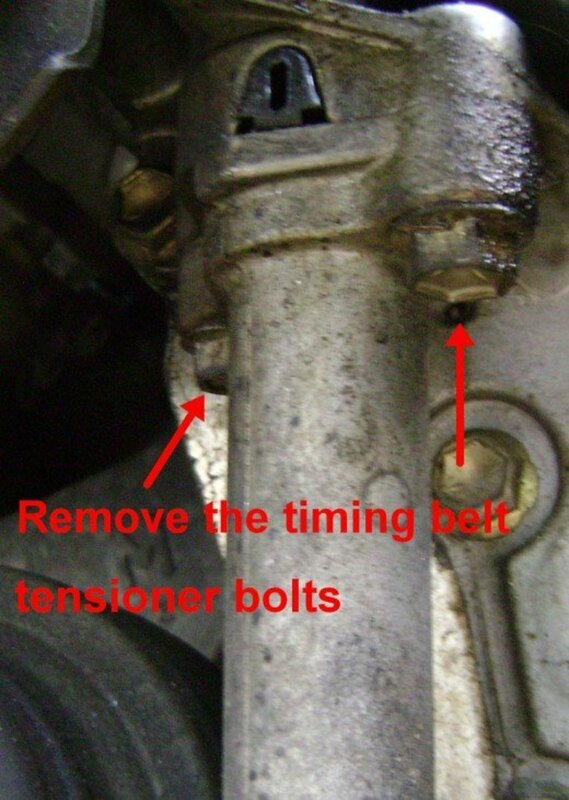 Loosen the tension on the alternator adjustment locking bolt (J). Turn the alternator belt adjustment bolt counter-clockwise until the alternator belt can be removed by pushing down on the alternator. Loosen or remove the power steering pump bracket bolt (K,L). With either a long metal bar or crowbar, apply pressure to the left side of the pump to relieve tension on the power steering belt (M). Alternatively, a few light taps with a hammer on the power steering pump bracket will move the pump forward of the bolt and relieve tension on the belt. 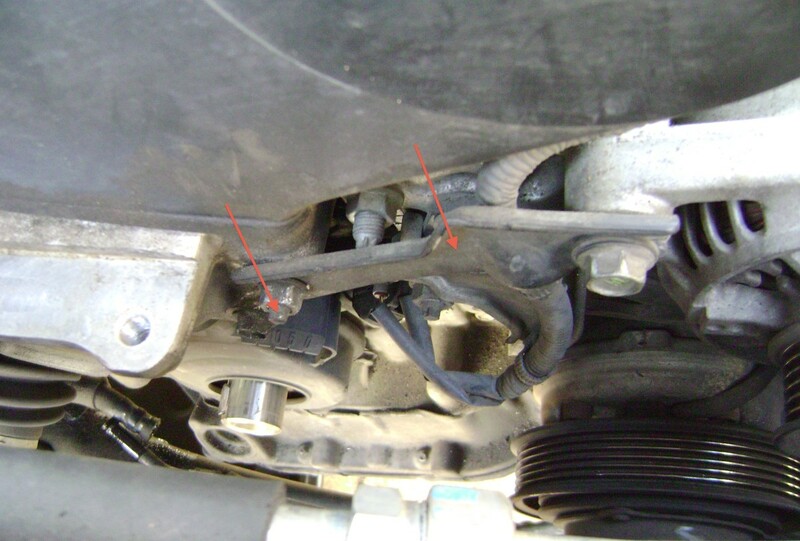 Remove both the alternator and power steering pump belts. Remove the crankshaft pulley bolt (N) and remove the pulley (see video at 4:40.) If the pulley does not slide out with a simple tug, a pulley removal tool may be required (O). A. Remove these bolts to remove the passenger-side fender apron. B. Remove the crankshaft pulley bolt. 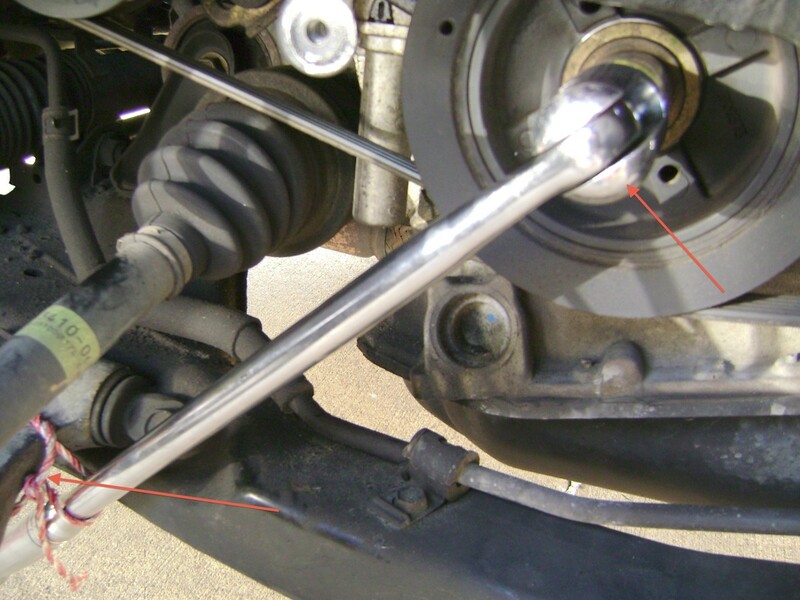 D. To loosen the crankshaft pulley bolt, secure the 22 mm socket to the bolt (upper right) and brace the breaker bar against the lower control arm (lower left). E. Rotate the engine to TDC (Top Dead Center). F. Align the crankshaft pulley's TDC mark between the 10 and 5 degree marks. G. Remove power steering hose clamp and hose. H. Reconnect hose and clamp when fluid drainage is complete. J. 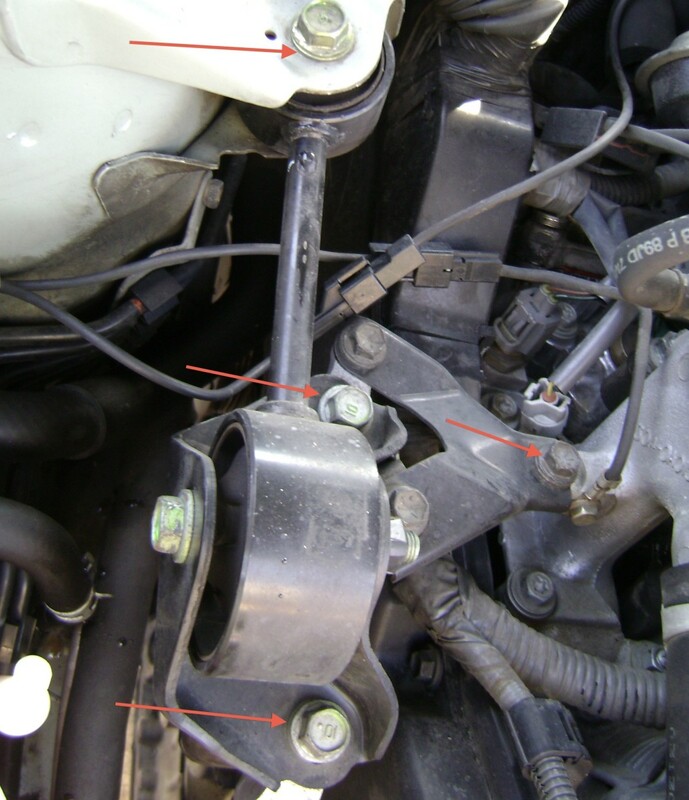 Loosen the alternator locking bolt (left), then turn the alternator belt adjustment bolt (right) counter-clockwise to relieve tension on the belt. K. Loosen and remove the power steering pump bracket bolt. 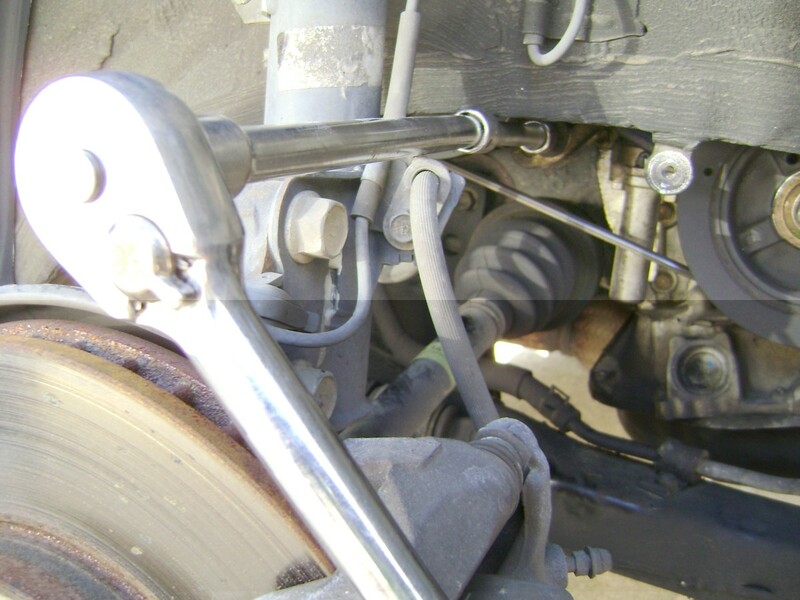 L. Loosen and remove the power steering pump adjustment bolt, with a socket wrench attached to a ½” extension. M. Pivot the power steering pump to create slack in the power steering pump belt. 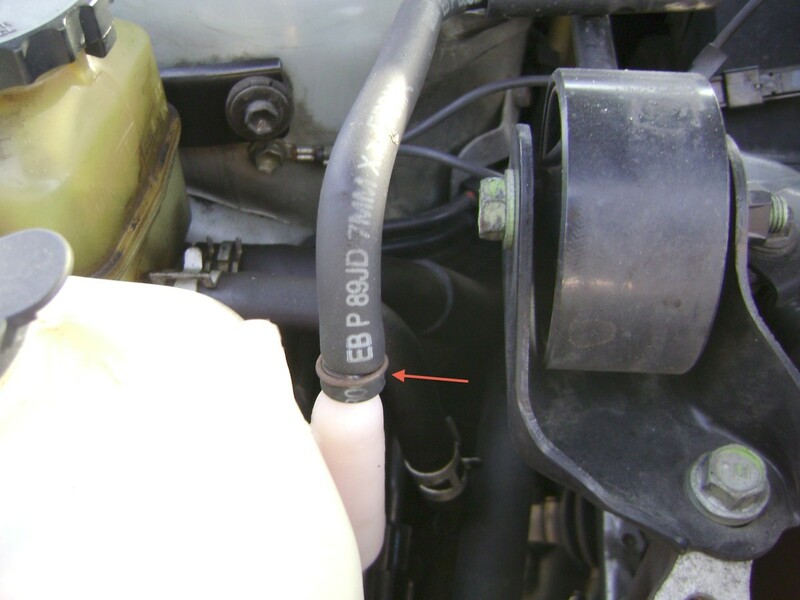 Disconnect the coolant reservoir hose from the reservoir container (P). 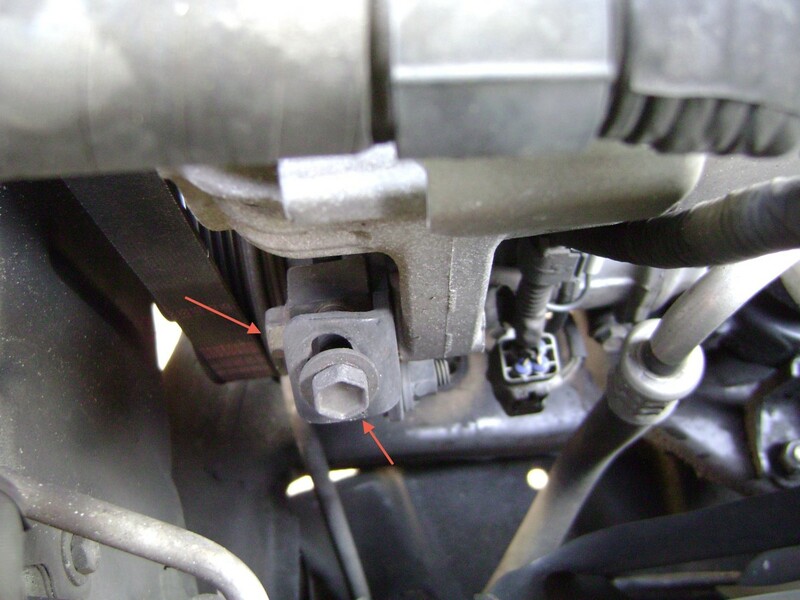 Disconnect the two engine ground wire connectors (Q). Unbolt and remove the side engine mount (R, S). Remove the alternator bracket nut and bracket (T). Optional: to give yourself more room to work, you can detach the power steering hose and move it to the firewall (U, V). Unbolt and remove the lower timing belt cover, the upper timing belt cover, and the side engine mount bracket. Keep the one long bolt in place while removing the bracket (W). Remove the timing belt guide (X, Y, Z, AA, BB). 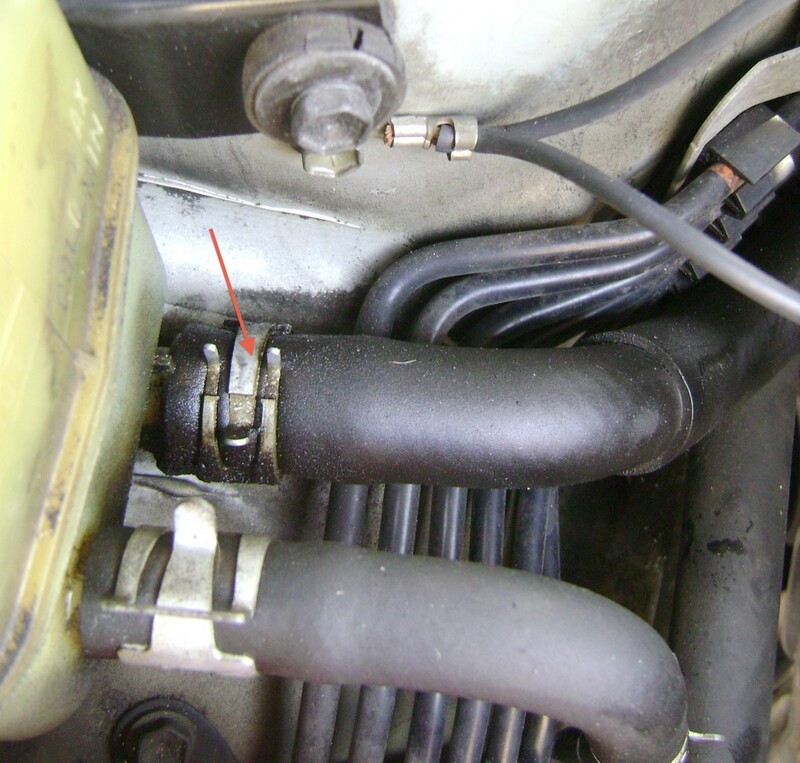 P. Disconnect the coolant reservoir hose. Q. Disconnect the engine ground wire connectors. 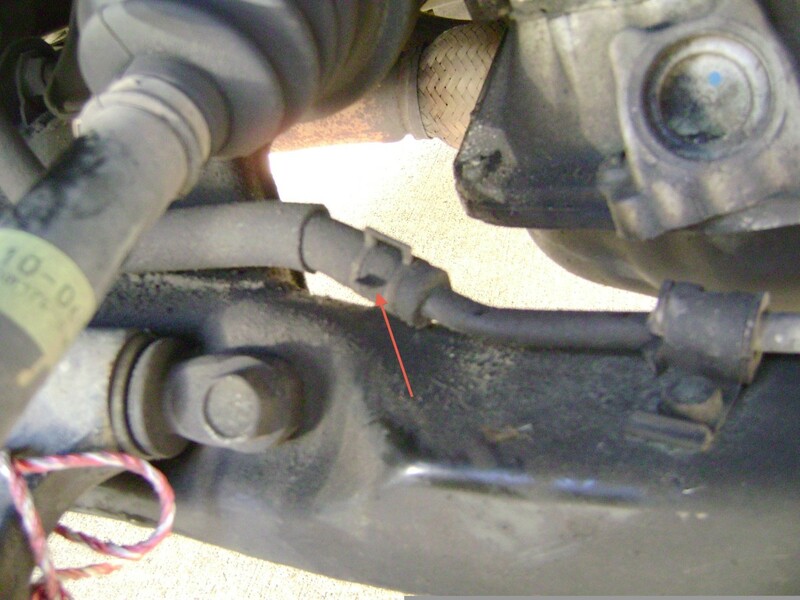 R. Remove bolts in order to remove the side engine mount (torque rod). T. Remove alternator bracket bolt and bracket. 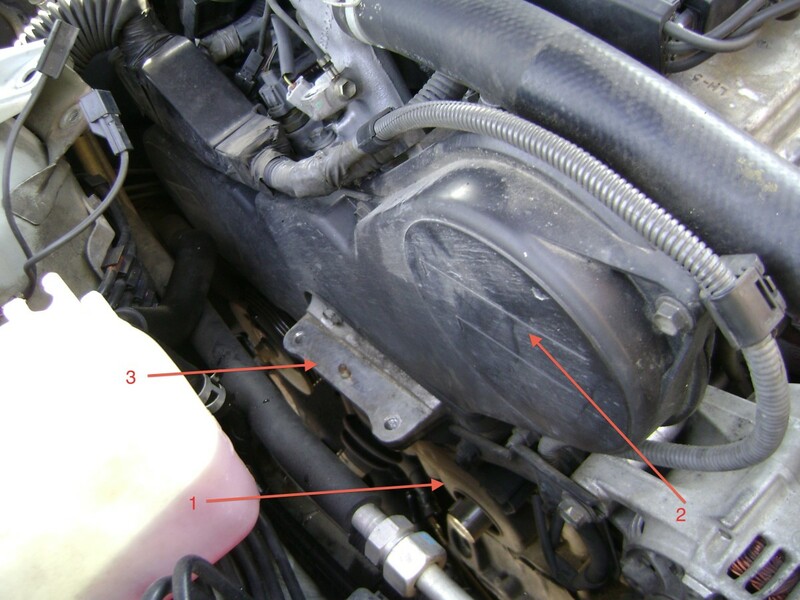 W. Unbolt and remove the lower timing belt cover (1); the upper timing belt cover (2) and the side engine mount bracket (3), leaving the long bolt in place. X Remove the belt guide. Check that the camshaft alignment marks match the backing plate alignment marks. If not aligned, screw the crankshaft bolt back in and rotate the engine with a wrench until alignment is made (CC). After the engine is aligned, apply paint marks to the camshafts and crankshaft, to their backing plates, and to the timing belt. These marks will help with re-alignment if the crankshaft or camshafts happen to move during belt installation (DD). Unbolt the timing belt tensioner (EE). *NOTE: For the 3MZFE engine (i.e. the 3.3 liter V6), the belt tensioner has been redesigned and the lower right motor mount has been added by Toyota blocking removal of the tensioner. 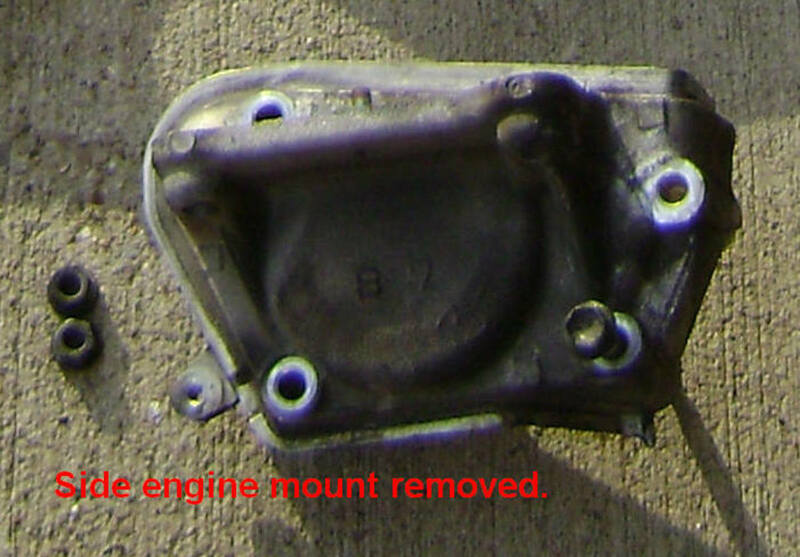 To remove the 3MZFE belt tensioner, the right lower engine mount must first be removed followed by the engine mount bracket. To do this: 1. Remove the front motor mount bolt. 2. Remove the lower right motor mount upper and lower nuts. 3. Place a hydraulic jack with wood block under the engine oil pan and slowly tilt the engine up until there is enough clearance to removed the right motor mount. 4. After the mount has been removed, unbolt the mount bracket which will allow access to the belt tensioner bolts for removal. 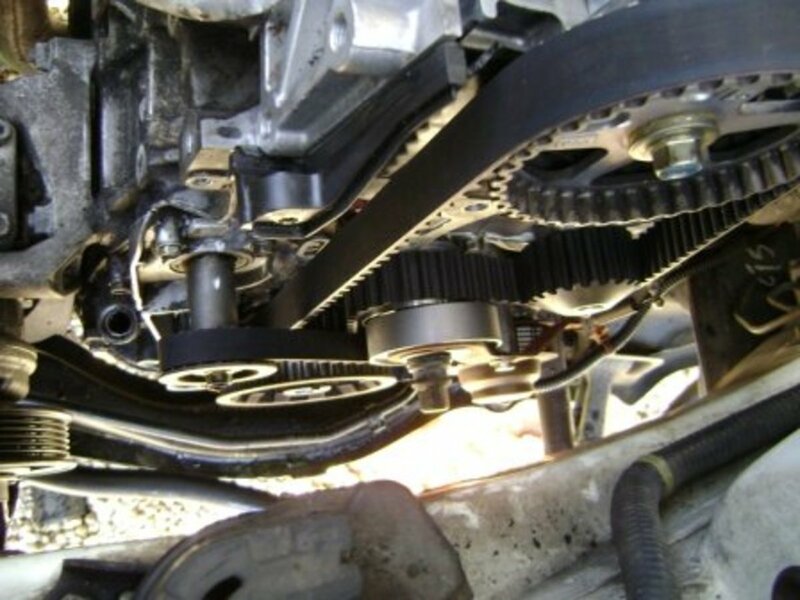 Twist the timing belt about 45 degrees, simultaneously, in two places: between the right camshaft and the crankshaft, and between and the right camshaft and left camshaft. This will slightly move both camshafts clockwise, which makes it easier to remove the old belt, as well as easier to install the new belt. A small amount of slack will now exist between both camshafts and between the right camshaft and the crankshaft. Remove the old timing belt (FF). Transfer the paint marks from the old belt to the new belt: set the old belt down, place the new belt over the old belt with their cogs aligned, and wherever you see a mark on the old belt, place a matching mark on the new one. CC. If out of alignment, rotate engine using crankshaft pulley bolt. 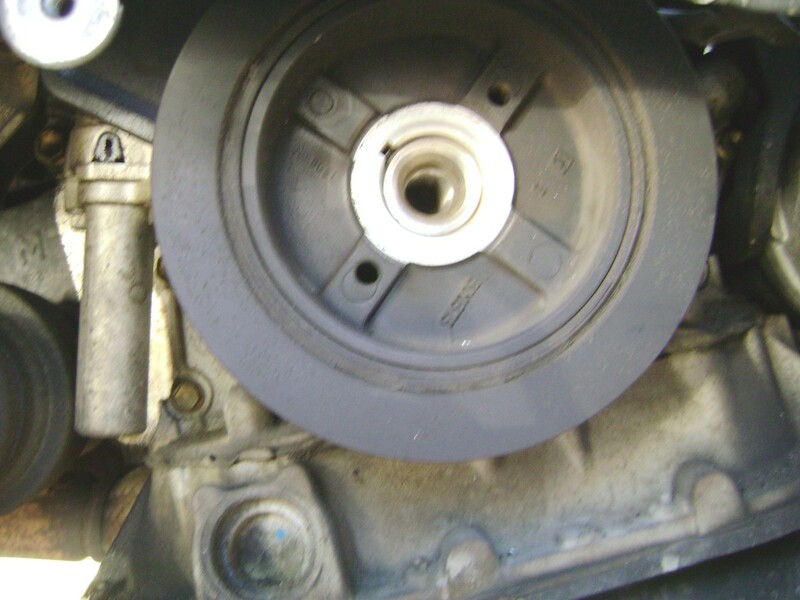 Apply paint marks to camshaft pulley, timing belt, and backing plate. DD. 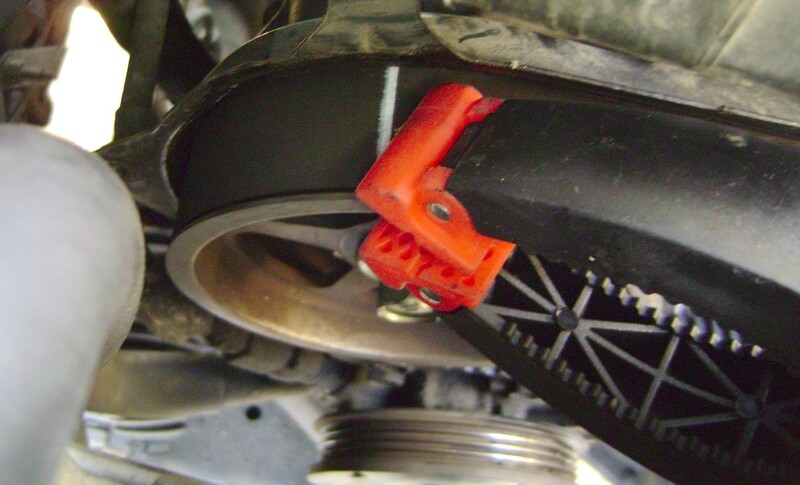 At TDC, apply paint marks to the old timing belt, crankshaft pulley, and engine. EE. Remove the bolts to remove the timing belt tensioner. FF. 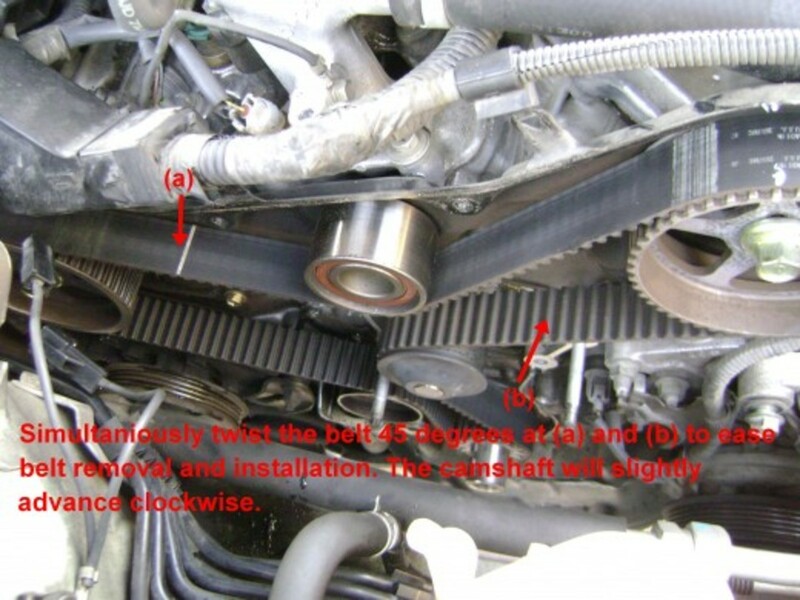 To make the belt easier to remove, and the new belt easier to install, advance the camshafts slightly by twisting the belt 45 degrees at (a) and (b). If you want to replace the water pump as part of this job, a 10mm stud removal tool or an "E" socket will make it much easier. This tool or socket will ease removal of the pump's mounting stud, thereby allowing the pump to clear the camshaft-side timing belt cover. Removing the stud is easier than removing the camshaft sprockets and belt cover before removing the pump. Use a wire brush (see video at 13:50) to remove any residual corrosion before installing the new gasket (I use a round brush mounted on a angled drill). Denso water pumps come with a metal gasket with a rubber coated inside lip which does not require any RTV. If you purchased a timing belt component kit, your kit should include a new guide pulley or idler pulley (the pulley between the two camshaft sprockets) and a new tensioner pulley (between the crankshaft and left camshaft). The guide pulley can be easily replaced by unbolting the old and bolting on the new. The tensioner pulley is slightly more difficult. This pulley is part of an assembly that allows the pulley to dynamically apply continuous pressure on the timing belt (via the tensioner) to take up the slack if the belt stretches. The tensioner mounting bolt runs through a sleeve that allows the pulley to move approximately 30 degrees to take up belt slack. Letters refer to photos at the end of this section. Click on a photo to enlarge it. See also the video at 24:00 and following. Start by installing the new belt on the right camshaft using the paint line on the new belt (GG). Prevent the belt from slipping off by using a spring loaded plastic alligator clip (HH). Stretch the belt and slip the belt onto the left camshaft. Again, use the paint line on the new belt for alignment and use a plastic alligator clip to prevent the belt from slipping off. Guide the right side of the belt over the water pump and then position the belt on the crankshaft pulley cogs. There should be little to no slack when this is done. Slack may be a sign that the belt is loose by one cog. 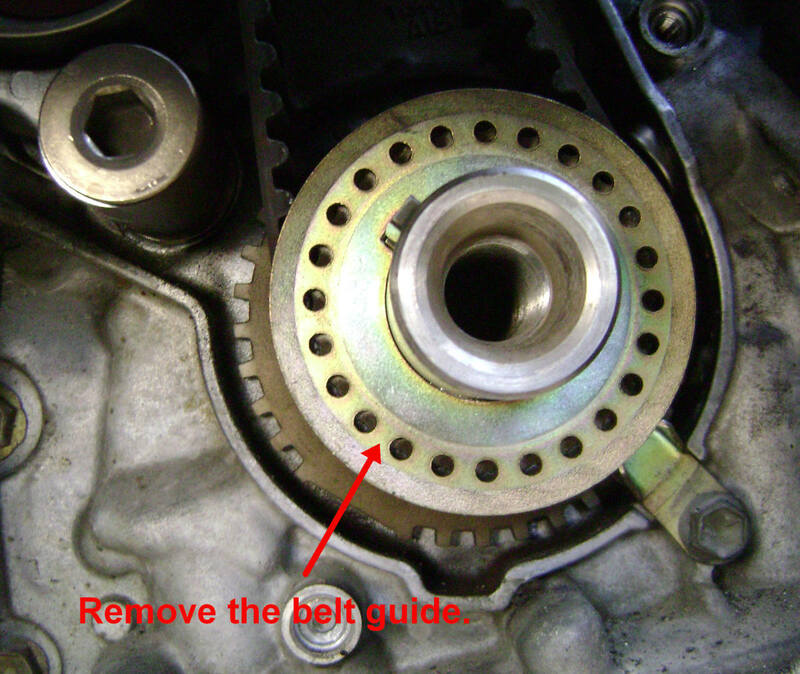 While holding the belt in place over the crankshaft pulley with the right hand, use the left hand to slip the left side of the belt over the tensioner pulley (II). Bolt on the timing belt tensioner. Applying alternating equal turns on each bolt will gradually compress the tensioner pin against the tensioner pulley assembly. As this occurs, the timing belt will tighten up. (Optional:) At this point you can start the car to check the belt alignment. 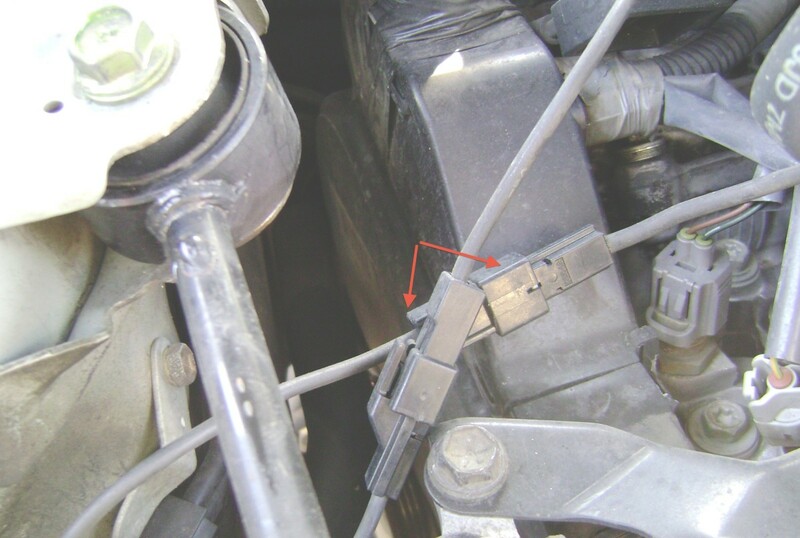 If the car misfires, or the "Check Engine" light comes on, turn off the car, connect the crankshaft pulley bolt, and rotate the engine with a ratchet wrench to the alignment marks. Being off by one cog will cause an engine misfire. If this happens, the problem is usually between the right camshaft and the crankshaft. Reverse the outlined instructions to reconnect removed components (JJ). The crankshaft pulley bolt can be 'shocked' (torqued) on with a mechanical impact driver, if either an air or electrically powered impact driver is not available (you may be able to rent them at an auto retailer). Alternatively, you can always bring your car to a private garage and ask them to torque the bolt on for you. Usually they'll do it for free out of professional courtesy. If the power steering fluid was drained, pour in new fluid and turn the steering wheel right to left to create suction. The fluid level should drop. Add more fluid and repeat the procedure until the fluid level has stabilized. GG. 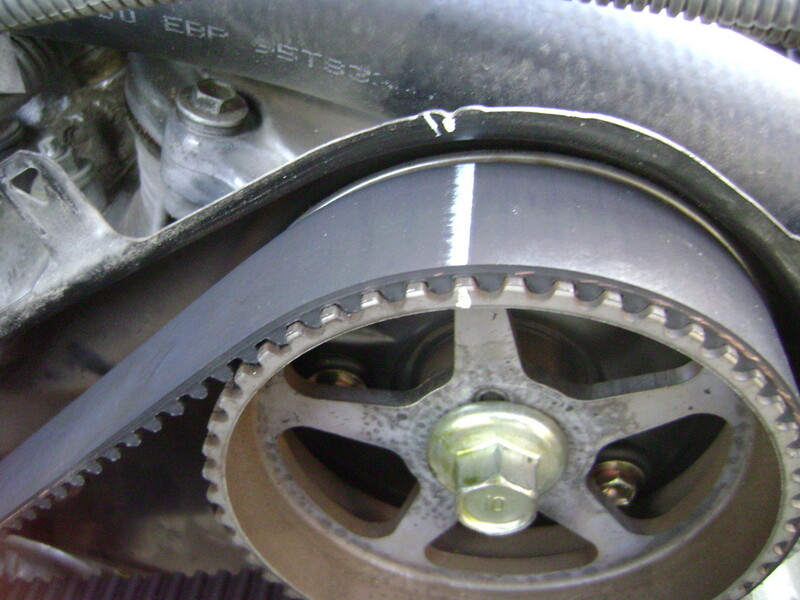 Put the new belt onto the right camshaft sprocket, using the paint mark on the belt for alignment. HH. 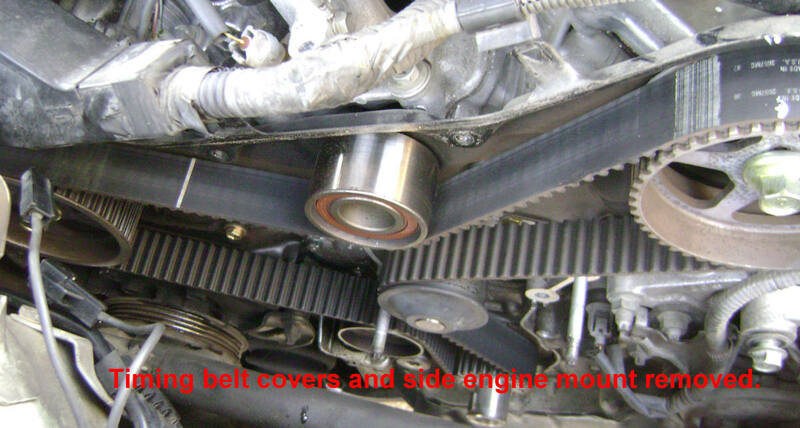 Stretch the belt onto the left camshaft sproket. Secure the belt onto the sprockets with plastic alligator clips. II. Stretch the right side of the new belt onto the crankshaft pulley, leaving no slack between the crankshaft and right camshaft. Hold it there with one hand, and with the other hand slip the left side of the belt over the belt tensioner pulley. JJ. After installing the new belt, put parts back in this order. 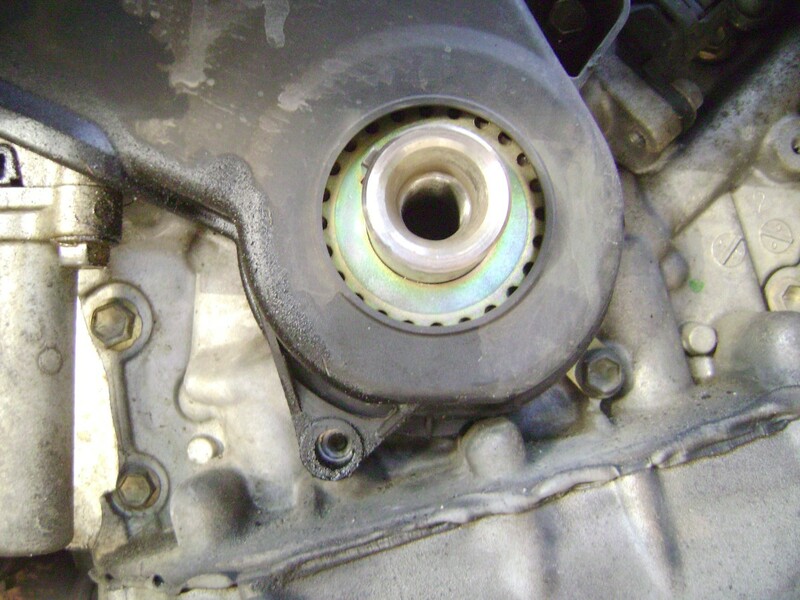 If when you replace the firewall-side camshaft oil seal you notice oil leakage from the valve cover gasket—which is not that uncommon in high-mileage cars—you can go to my other article on how to replace the valve cover gaskets on a Lexus ES300, which has the same engine and layout as your six-cylinder Camry. I put a new timing belt on my '95 Toyota Camry LE V6 3.0, and now my engine won't turn over. What should I do now? You'll have to double check all your work. My dad has a 2002 Toyota Avalon XL with the 1MZ-FE engine. I have already replaced the rear valve cover gasket as I notice oil leaking. However, after changing the rear valve cover, I still see some oil sipping down from the corner of the valve cover right below the timing cover on the rear passenger side. Could it be coming from the rear cam seal? 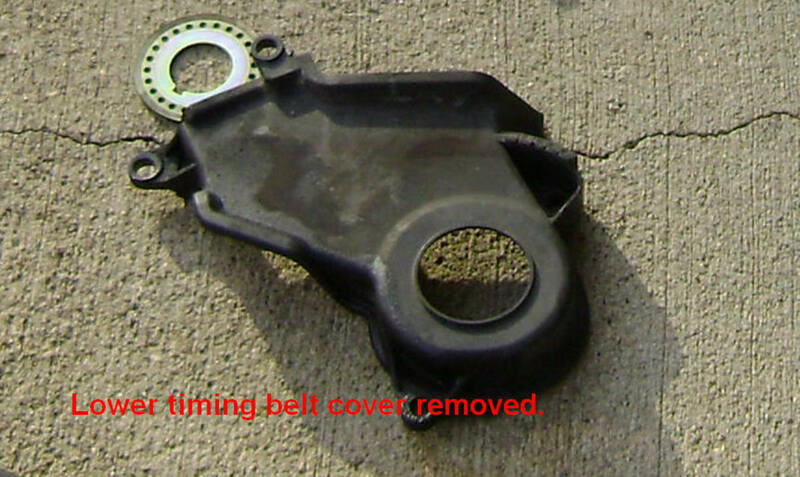 Is it possible to remove the #2 timing cover without removing #1 cover and/or the side mounting bracket? I have Sienna 2006 3.3l, and it has a VVT-i engine. I was driving 70 miles/hour and the timing belt broke. What is the chance that the valves are bent? I have a 2006 sienna 3.3 l, and it just didn’t start one morning. The tensioner/ tensioner pulley failed. I replaced the whole timing kit, but before I put the belt on, I safely lined up the camshaft marks and the crankshaft mark without causing damage. Any advice? 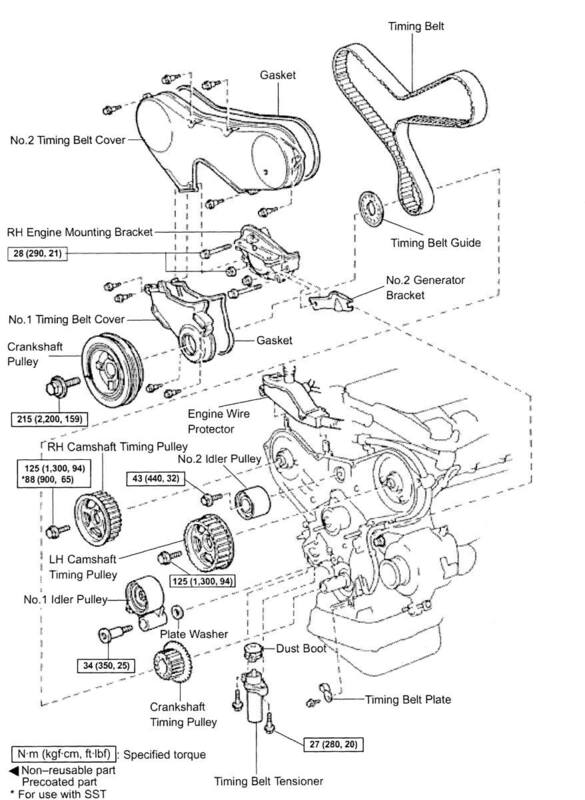 Do you have similar detailed instructions to remove an axle from a Toyota Camry with a 3.0L 1MZ-FE Engine? If you're dealing with the driver's side, you can use the Toyota Camry 2.2L 5SFE instructions, but I don't have one yet for the passenger side. Do the arrows on timing belt point toward the engine or the mechanic? When removing the side engine mount, do you need to support the engine with a jack from underneath? The marks are an aide; not a necessity. You can still mount the belt without the marks. I got wiped out from cleaning dirty grease of the bottom camshaft mark was gone for timing belt. What can I do. Never worked on a 96 Camry V6. What should the timing be set at for a 96 camry 3.0? Yes. The only thing that might be different is the timing belt tensioner. I explain the difference in my article. Does this procedure work for the same engine(2003 1MZFE V6)VVTI? Did you watch the complete video? It depends if the engine is 4 or 6 cylinder. The 4 is no problem. You'll just have to re-align the timing marks on the crankshaft and camshaft when installing a new belt. Same thing with a 6 if it is NOT a VVT-i engine. VVT-i is an interference engine and the piston could touch and bend the valves. If it is VVT-i, and if the belt broke at idle, you might have a chance that the pistons did not bend the valves. Only way to tell is to do a compression test or simply installing a new belt and see how the engine runs. In the future, before you take on what you think will be a complex job, take pictures each step of the way so you don't have to rely on your memory so much. Old, bad oil pump finally off. So much had to be removed before I was able to get off the pump. Oil pans #1&2 off, exhaust pipe, inspection plate with hidden bolts, had to heat bolts holding exhaust bracket to oil pan #2. Very tight space to work on bolts. But they caved and I got pump off. New pump is on and I'm slowly putting the pieces back together. I'm forgetting where things went like brackets to ac conditioning and alt brackets. Hoping to have car back and ready for the big test in a day. If I am successful, I'll be amazed. If something goes wrong, well, don't know. Thanks for the help. Wishful praying. I have all the oil pan bolts removed and the pump is loose, but the two bolts that hold the oil strainer is keeping the pump from complete removal. I can't lift the pump up so the bolts clear. I looked at a Autozone site with instructions, once again and it looks like I still have more things to take off. I took lots of screenshots and notes. I'm going to give it another try. If I still cant remove this pump, I'll be having a Lexus BBQ. Ha ha. Wish me luck. Fingers crossed. I'm going to guess that it's stuck to the oil pan because you did not remove the oil pan bolts ... or you need to use a pry bar to brake the adhesion from the RTV seal. Toyota sealant is very tough. Yes. Mechanic said it was going out and later that day, it did. He just wanted $1,600.00 to do the repairs and that's money we dont have. I see why its so much $$$ tho. I have it almost off but cant figure out why its not coming completely off. I'm stuck. Nope. Are you sure you need to remove/replace it? Do you have anything showing how to remove the oil pump on a 1997 Lexus es300? I'm getting a bit frustrated? No problem .... glad I could help. Keep on plugging and your skills will improve. Thank you for correcting my mistake of using "overnight wait" to avoid the camshaft jump issue. Now I understand that it is the valve springs who cause the "jump issue". Thank you again for giving us "amateur mechanics" thoughtful lessons again and again. The camshaft may "jump" due to the valve spring(s) being compressed. The compression occurs when the cam lob high point applies pressure to the valve. So after the jump and when you turn the camshaft back to the TDC position, you are re-apply valve spring pressure and compression to some of the valves. One thought about the problem of “back camshaft might jumps” on the moment a timing belt is being removed. Because at any moment or position, one of the six cylinders will be in “compression status”, aligns crankshaft pulley marks to Top Dead Center (TDC) will still have this tension problem. 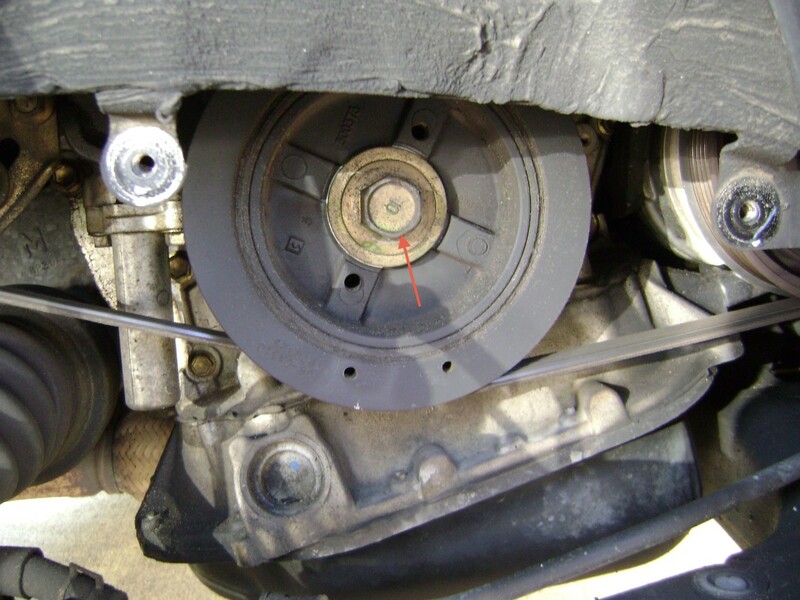 To solve this problem, a person can aligns crankshaft pulley marks to Top Dead Center (TDC) and let the car “sleep in the garage for a night”. I guess next morning the “compressed cylinders” will have no more pressure tension due to air leaking. Will this “sleeping” method remove the potential “jumping” problem for sure? Thank you for answering my “using parking gear and driver side front wheel on the ground” question to remove crankshaft bolt. I will do that. It will be nice to find some good and true videos there. Can't wait to see the other stuff you do. Thanks for your complements and kind words. I do try to put out quality work that a layman can understand. BTW - I just started a youtube channel under "David Fain" that you can subscribe to for other DIY articles, if interested. I wanted to say "Thanks very much" to the author, hardlymoving, for this awesome dyi guide. I'm far from a mechanic and would like to be even farther away, but I can't pay a repair shop $1,600 to do this job. This article is what I needed to guide me through this horrible repair. But, it's my girlfriends only ride. She does so much volunteer work handing out food at the Clear Lake Gleaner, driving their truck and trailer to other Gleaners around Lake County Ca, getting up at 4am. On top of that she does in-home health care, enrolled in 2 colleges to finish getting her Master, doing side jobs to help with rent and other bills, and still cooks a great dinner at night. She is the hardest worker I've ever known. Keeps going and going to help others. She can't be without a vehicle much longer. Anyway, that's why I decided to get greasy and at least get the majority of the work done. I know my way around a few nuts and bolts, I've done this sort of thing in my younger days, but I'm more of a non greasy, put in nice stereo, tint the windows and make it shine in and out. Thanks again for easy to understand guide. Great job. Never tried it but might work in prevent the wheel from turning. No, should harm the transmission. To remove a stubborn crankshaft bolt, my friend told me to leave the driver side front wheel on the ground, put the gear on Parking and then use a very long extension rod to connect the bolt. This way I will have plenty of room to use a cheat bar (six-foot long) to unscrew the crankshaft bolt. Will this method damage my transmission? The MZFE V6 engines are basically all the same with respect to time belt/water pump replacement. The later model engines changed the belt tensioner and you have to move the ps pump bracket around to get a 1/4" 10mm socket to remove the 2 bolts that secures the tensioner. What I did before was to remove the side motor mount but found that to be too much of a pain as well. If the cam sprocket jumps, I just re-position the sprocket. I don't do anything special in terms of advancing/retarding the crank or cam before belt removal. Just adds to the confusion of a simple job. SST stands for Special Service Tool. I just tighten the bolt with a long breaker bar. Thank you so much for this detailed instruction. 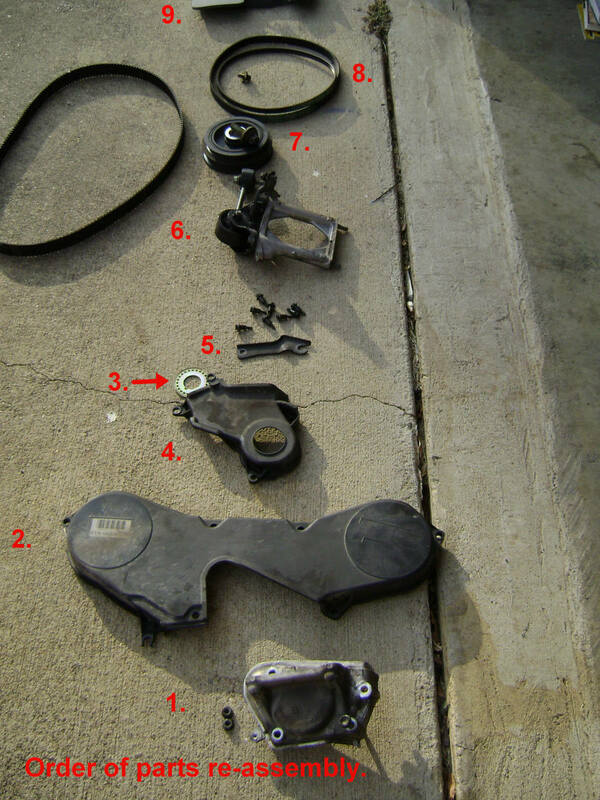 I will be working on my wife's 2005 Lexus ES330 (180k miles): all TB components including cam seals and crank seals. After lining up Crank and cams at TDC, Toyota Service manual states to turn crankshaft approx 60deg CCW prior releasing belt tensioner. Doesn't turning 60 deg CCW throws off the initial TDC alignment. As I will be replacing both cam seals, what do you do when the rear cam spring forward (CW) during camshaft sprocket removal? Do you simply turn it CCW and align it again? or you have to turn CW full and lign up the mark again? I have done 1MZFE timing belt before on 1999 Solara but this interference 3MZFE chickens me out lol. rather than 95 for the front one, do you know what the asterick is for? Believe its a VVTI interference engine. thanks for your quick reply. I did a google search and found the following information on the car based on VIN#. down below is the engine model. Based on the following, can you let me know if it is still "interference engine"? I believe models (2004 and up) use the 3.3 liter 3MZFE engine which is VVTI interference engine. You mentioned that in models before the 1999-2003 introduction of VVTI (Variable Valve Timing) technology, the engine's valve train is “non-interference". How about the models after 2003? I have a 2005 Camry V6 that does has VVTI (Variable Valve Timing) technology? does the VVTI make the engine's valve train is “interference"? Replace the rods, pistons, rings, main bearings and re-hone the cylinder walls. Your confusion was caused by rotating the engine several times to check the alignment. That is not necessary and only works on single camshaft gear set ups. Just get the engine to TDC and align the belt with the camshaft alignment marks. Pull out the tension pin from the tensioner after alignment and your done installing the belt. Thanks for your response. I'm not sure what you mean by "There should be a both a V and dot metal marking on the engine a timing gear". Can you explain a little more on that ?Thanks again and appreciate you help. To ensure the crankshaft is a TDC, you can temporarily re-install the lower timing belt cover and harmonic balancer (cranshaft pulley) and align the balancer timing marking with the 0 degree mark on the timing belt cover. Then remove the pulley and cover. There should be a both a V and dot metal marking on the engine a timing gear that should now be in alignment at 0 degrees. Correction: (by making sure piston 4 is at the top, since piston 4 is sync with piston 1 which is at the back). I’m changing timing belt for 04 RX330 with 3MZ-FE engine. After putting in the new belt and aligned the 3 timing marks (left and right camshaft and crankshaft pulleys). I turned crankshaft 2 full rotations but without pulling the tensioner pin. Recheck the 3 timing marks, unfortunately they are not aligned. I remove the belt but messed up the timing marks. Now I’m able to set TDC for crankshaft. (by making sure piston 3 is at the top, since piston 3 is sync with piston 1 which is at the back). My question is after made sure crankshaft is at TDC, can I simply align the left and right camshafts timing marks and reinstall the timing belt? Sorry ... don't understand your question. The starter running without any resistance indicates a broken timing belt. The valves being bent or not is a 50/50 proposition. Throw on a new belt, start the car and see how it runs. The VVTI lettering is noted on the silver plastic engine cover when you open the engine hood. If you can bring your car to Memphis, TN, yes, I can fix it. This is a great article! Great job. You wrote, "In models before the 1999-2003 introduction of VVTI (Variable Valve Timing) technology, the engine's valve train is “non-interference,”..." I have a 2003 Camry V6, which died on the freeway yesterday. The starter runs way to free but I haven't looked under the hood. - How can I tell if my 2003 has VVTI or not? My 2nd question is can I bring my car to you to fix!? Just turn the camshaft sprocket back to the alignment mark. Thank you for the quick response and the great article. I figured out the problem. After I would let go of the belt where it was wrapped around the crankshaft sprocket, the firewall side of the belt would constrict by a tooth causing me to not have enough slack to install the tensioner. Once I realized this was happening, I put a a large socket between the No. 1 idler pulley and it's bracket which would keep enough pressure on the belt to keep it from jumping a tooth on the crankshaft sprocket. After I put the tensioner against the belt, I'd pull the socket out. I had enough slack in the belt to install the tensioner. My tensioner had 12mm bolts. After installing the belt, remove all timing belt slack from the other side of the tensioner. You can do that by either turning the crankshaft either clockwise or the firewall side camshaft pulley counter clockwise. You can use any type of clip to prevent the timing belt from jumping a clog from the camshaft pulley. You should then have enough space to insert the tensioner bolt through the tensioner's top bolt hole. I use a 1/4" 10mm socket attached to a short extension to get the threads started. You'll have to push the tensioner against the tensioner pulley bracket to get the hole lined up. Once the top one is in, the bottom bolt is relatively easy to install. If you're doing this with the motor mount in place, you'll have the move the power steering pump bracket either up or down to get a path to either hole. I use a long pry bar or rod to tap down or up on the steering pump bracket. I have a 2007 Highlander V6 3.3 liter (3MZ-FE) AWD. The tensioner bolts are 90 degrees to the direction of the pin. If I try to install the belt with the tensioner removed, I can't force the belt over far enough to align the tensioner with its bolt holes. If I try with the tensioner installed but the pin pushed down with a hex wrench holding it, the belt won't slide on the #1 idler pulley. Should I just force the belt on the idler or is there something else going on? This is the best instruction for replace Toyota Timing Belt. thank you very much! That's a tough seal to remove and install without special tools. I use the "Lisle 58500 Hook for 58430"for seal removal and a Cam Seal Installation tool which presses it in evenly. Around a 5 minute job. Well, knocked it out. Unfortunately the rear cam seal is still leaking after replacing it (*%&$&!, *&%@ ,etc). Of course, it would be that one, the biggest PIA to get to. Soooo, I may need to do it again. But, the good news was, after replacing everything, belts, tensioner, pulleys, waterpump, cam and crank seals, etcs....wouldn't you know, it started back up again. Woo hoo. Hadn't been that far into a car repair before, so I feel pretty good. I may allow it to leak for a bit, before getting at it again. Thanks for all the advice. 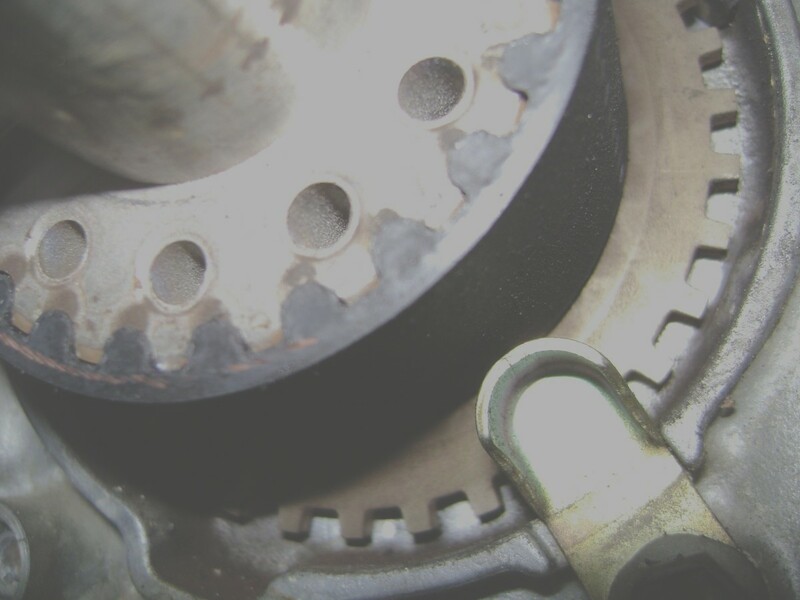 I recently did 2 belt jobs on the 3.3 ltr V6 engines (2005 Sienna & 2004 ES330) and was surprised when the rear camshaft sprocket "jumped" clockwise around 45 degrees if the sprocket was accidently advanced one cog. No big deal. I just re-positioned the sprocket back to the alignment mark. Thanks for the feedback. I was able to find the manufacturers manual on this. 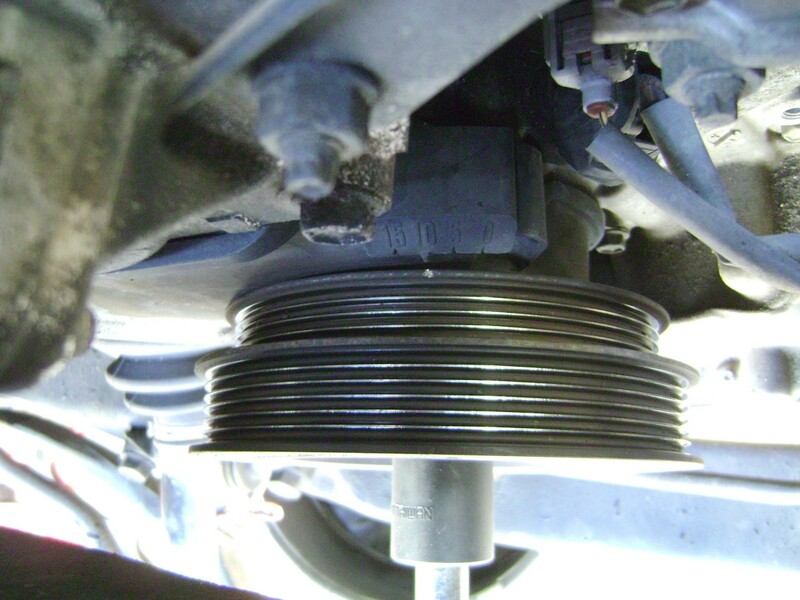 Seems with the 2005 Sienna, they do recommend turning the crankshaft counterclockwise by 60 degrees prior to removing the belt to release the spring tension. Yet for my model (1998)the guide mentions none of that, and like you said, just remove it. The entire "counterclockwise" of the crankshaft was what was bothering me because everywhere you read there is always the disclaimer, "do not turn the crankshaft counterclockwise". Thanks again. You line up the camshafts with the backing plate alignment marks and the crankshaft to TDC (Top Dead Center) with the crankshaft sprocket at the 12:00 o'clock mark on the engine. There's no need to moving the camshaft positions if the Crankshaft timing mark is at Top-Dead-Center (TDC) and the left and right camshafts are at there alignment marks prior to belt removal. Afterwards, you can advance the camshafts to the right by one cog to mount the belt and then position it back. Excellent writeup. I have a 98 Sienna. Looking to DIY this. Have watched a number of YouTube videos. I need to change the CAM oil seals too. The one step that concerns me most is the talk about the rear CAM shaft's springs being "loaded" when at TDC, and that after I align everything at TDC, and prior to removing the old belt, I should move that CAM off of TDC to relieve the spring pressure. Any guidance or tips on how best to do that? Can I remove the timing belt and then carefully release the tenions on just that one CAM...or should I keep belt on, turn CRANK (which turns everything), and then remove the old belt. With only 30K miles, I would just replace the belt. I have a 99 Avalon 1MZFE with 30 K miles that I will be doing the first t-belt job. I do not see any major leaks from the wp or cams. Would you recommend replacing all bearings, seals, tensioner, water pump in addition to the t-belt? A cylinder head removal and re-installation is a lot of work compared to a timing belt/water pump replacement. On the V6, there are two heads - and you can't do one without doing the other. There would be a slight imbalance of compression if the head you're removing needs to be "planed" by a auto machine shop. You can reference my repair article on a Honda Accord head gasket replacement. I'd do a compression check before doing a head gasket replacement. 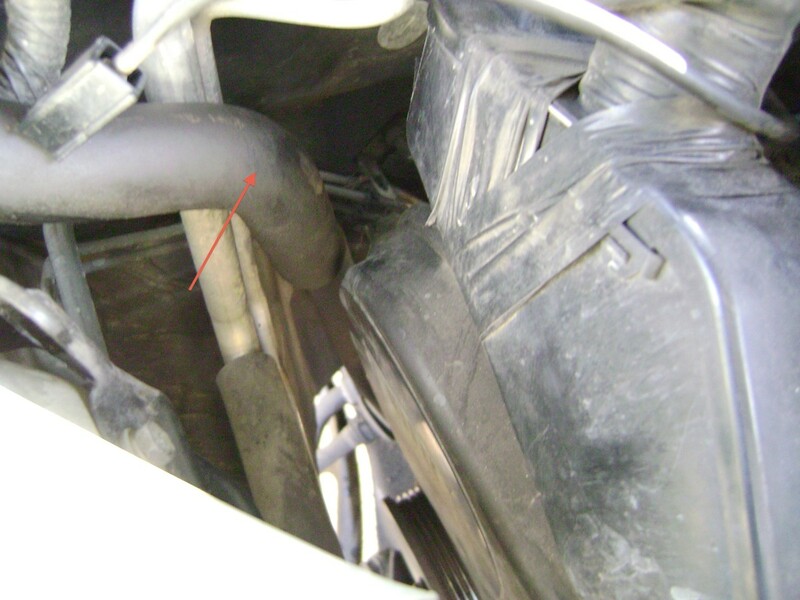 Also, check if there is white smoke coming out of your exhaust pipe - an indicator that coolant is leaking into your combustion chamber. Head gaskets usually get blown from overheating the engine due to lack of coolant. Great write-up. I have a 2002 ES300 that is due for a timing belt and just happened to blow a head gasket. You wouldn't happen to have a write-up on replacing he head gasket on this engine would you? Also, in my case, just the front is blown I think since all codes reference bank 2. I would like to shortcut this and not do bank 1. Bad idea? The last 2 words in your quote was "without VVT-i". I'm guessing that Toyota removed the valve depressions WITH VVT-i engines to increase the compression ratio and to control engine knock via VVT-i. Therefore, if the timing belt brakes, there is a chance of valve damage ... most likely if the brake occurred at high rpm's. The easiest way of finding out is to simply replace the belt and starting the engine before slapping everything back on (valve cover, accessory belt, side motor mount, etc.) Yes ... you can run the engine off the battery without having the alternator rotating. From my experience, I can have the belt on in around 1.5 hours. They (MZ engine series) feature cast aluminium pistons with an anti-friction resin coating (moly) and valve depressions that decrease the chance of valve-to-piston interference in case of timing belt failure on motors without VVT-i. Do you agree? Could you guess at the chance of valve damage after a timing belt failure, given the valve depressions of the VVT-i engine? It's cheaper to take your chances and have the timing belt replaced with 3 hours labor time. That's how long it takes me. Then start the engine and you'll know if the valves are bent. Otherwise, the work involved to determine if the valves are bent, in my opinion, isn't worth it when I could be taking the time replacing the belt. If the valves are bent, then you talking a big job taking off the cylinder heads to replace the damaged valves. Believed most shops will tell you to replace the engine or charge you upwards of $2000 or more. My 2006 sienna le stopped running in idle. It turns out the timing belt broke. I read online to see if the engine is ruined by this, but there are many contradicting informations. Some say the timing belt interfere the engine and some say it doesn't. I don't want to tow the van to the garage just to here that the engine is dead. Any advice would be appreciated! Suggest you view via your phone otherwise don't know what else to suggest. My shop does not have internet access to allow me to view this DIY with the pics. How can I print out the procedures PLUS get the detailed pics to walk me through this? Great instructions, by the way. Thanks so much for your help. Torques specs. 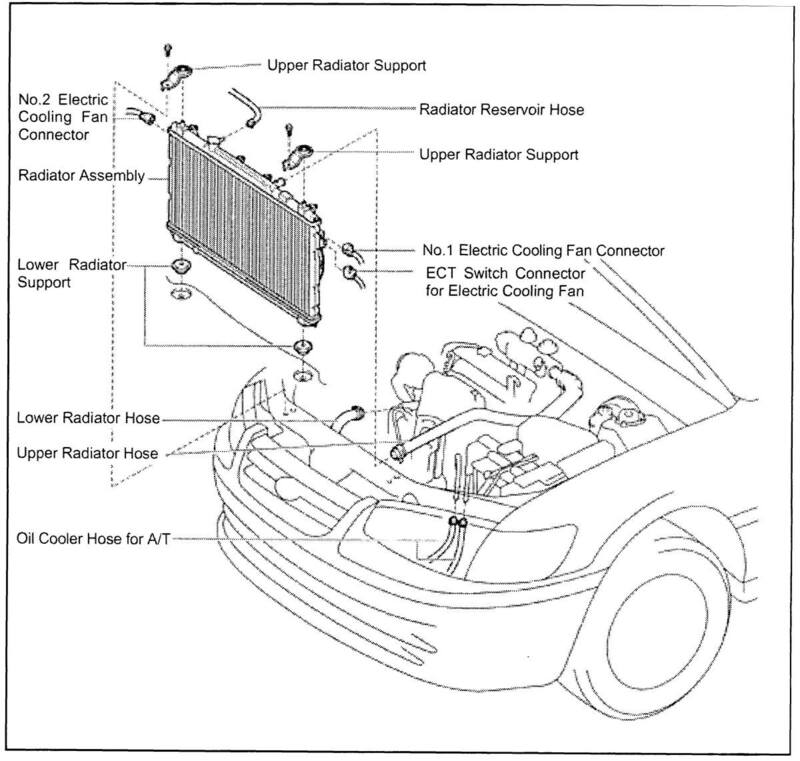 are noted on the component breakdown diagram. Re-assembly is the reverse of assemble. If one can't figure that out, they shouldn't be working on cars. The only people who "pull threads" are inexperienced mechanics who have no feel and therefore requirement a "good quality torque wrench". BTW - manufacturers tend to over-torque everything at the factory. First I want to say that your guide has great photos which are a must for a DIY guide. BUT you don't discuss the reassembly at all, most importantly torque specifications. This is an all aluminum engine and very easy to pull threads. This entire job MUST be done with a good quality torque wrench or disaster will follow! Hi could I use the same water pump for a Avalon 97 1mzfe as the 2000 cc Camry can it work the same ? Thank you so much that great that was my first time and I am very happy for what I have done. Alignment is only necessary when performing a belt replacement. After replacement, where ever the cams rest after engine shut down does not matter. I was wander if you could help me, I replaced a Toyota 1MZ-FE timing belt, the car turn on with the first start no problem no unusual sound, but 1 thing is made me bit confused me, dose the belt and cam 1 & cam 2 line have to be in place when you turned off the engine? or dose not mean every time be the same? If the rear camshaft is slightly off and the engine is running good with no MIL codes, then keep that setting. 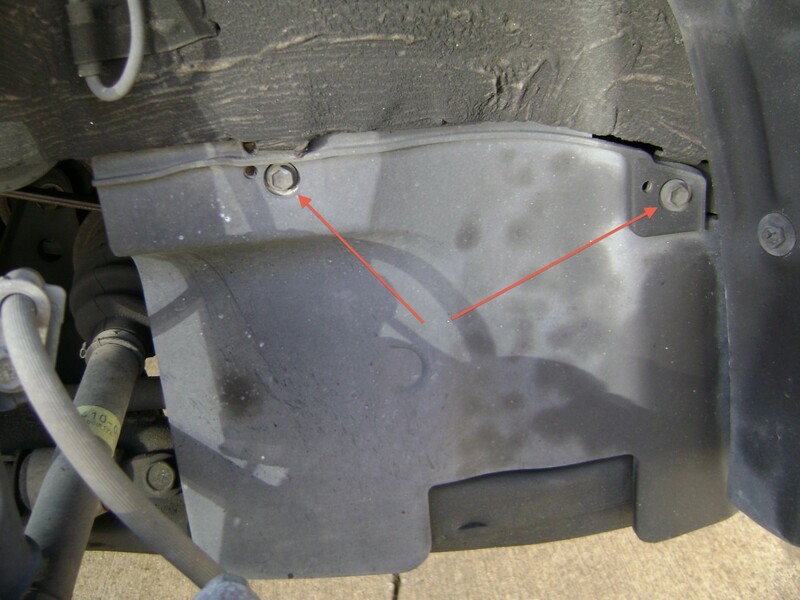 Apply paint marks on the rear cam and backing plate before taking off the timing belt. When I align the crank to TDC on my 3MZ, I was unable to get the rear bank camshaft pulley mark to align with notch on the backing plate. The front camshaft pulley lines up just fine but the rear camshaft is slight off. So my questions is, When I remove the timing belt, can I align the rear camshaft pulley to the notch with a wrench ? Rotate the engine and get the #1 cylinder to 0 degree TDC (Top Dead Center). This can be done by locating a dimple mark on the crankshaft pulley and rotating to the 12:00 o'clock position. Then align the dipple with the inverted U shaped mark on the engine casing. To double check, temporaily re-install the lower timing belt cover and crankshaft. The time mark on the pulley should align with the 0 degree mark on the belt cover. Set the left and right camshaft just a hair pass the timing belt back cover belt alignment notch (V shaped). Starting from the crankshaft, mount the belt on the crank pulley then weave up to the right crankshaft pulley. Secure the belt on the pulley with any clip (cloths or large paper ). Remove the slack on the belt by counter clockwise rotating the right camshaft. Now the right camshaft should be perfectly aligned. Weave the belt over the left camshaft and over the remaining pulleys on the engine. Re-installing the belt tensioner will remove the slack on the left crankshaft. 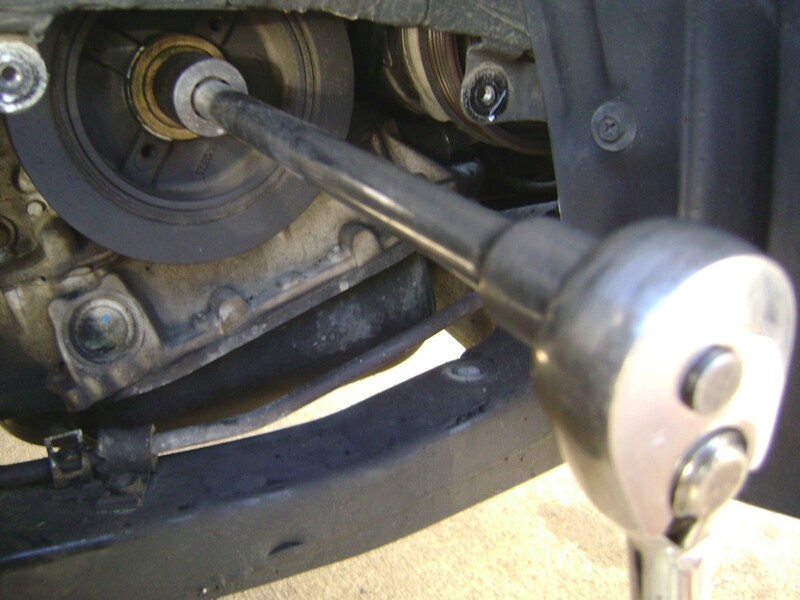 If you're worried about the camshaft moving, have someone hold the camshaft in place by using a breaker bar secured to the Camshaft pulley bolt. how can i put this thing back together properly, ive lined up all marks but looking from the pass side the top left cam sprocket skips right past the mark every time i try to set it on it. no matter how much i try. after setting it the proper way it wont start at all and smells flooding. PLEASE HELP as this car needs to be reliable for my wife and kids! I do know the past owner and he always took great care of it for his college daughter. Refer to my DIY article on doing a timing belt replacement on the I4 5SFE. The 3SFE is not too different from the 5SFE. 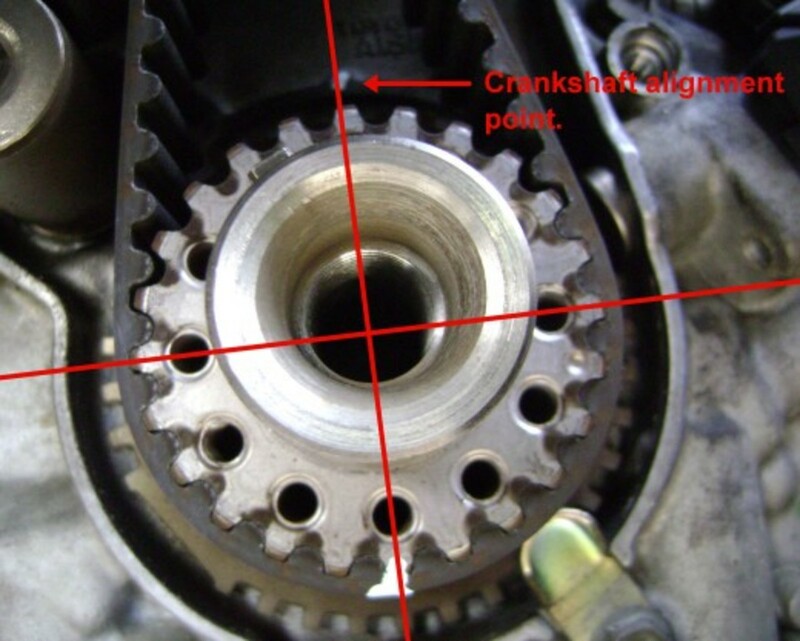 Basically, set the crankshaft at TDC (Top Dead Center) while noting the position of the Camshaft Sprocket TDC alignment marks. If out of alignment, your Camshaft Sprocket TDC mark will off (probably by one cog). I'll guess you'll have to advance the Camshaft Sprocket just one cog (clockwise). I've seen too many belt replacement jobs off by just 1 cog because belt tension was not relieved before the old belt was removed. The Camshaft was not slightly advanced in order to slip on the new belt; hence causing the timing to be retarded. I have a 89 camry 2.0L 4cyl 3sfe and changed oil seal and crankseal....my cousin gave me bad advice and we didn't mark tdc on timing belt and lost timing how d o I get it back? I write my DIY articles so that anyone with a reasonable amount of mechanical ability can do the job themselves with basic tools. Thanks Brian ... glad it helped you out. This is the best write-up I have seen! Thank you for posting with all of the pictures - it's invaluable. Nope ... you'll have to take the belt off and re-align. I don timing belt on 00 rx300 and one tooth off on crank is it possible to reset tension on tensioner or will I have to get another one? Excellent info on most repairs. Great reference material so thanks a heap. Doesn't really matter that much because once you have the upper & lower timing belt covers off, the crankshaft must be moved to align the camshaft pulley marks with the backing plate. With other TB jobs on the V6, zero degree alignment of the crankshaft does not guarantee precise camshaft alignment. Why align the crank pulley between 5-10deg...Haynes recommends 0deg? 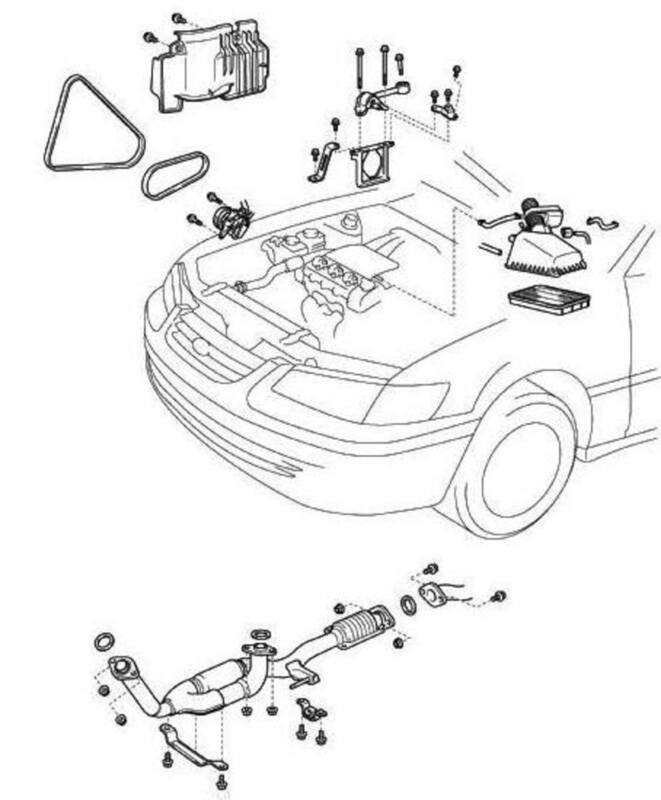 Although this hub is very informative, I'd still need a mechanic to do this. Thank tho. Voted up! I use an impact driver. Or use a socket wrench and socket; but you'll have to lock the engine from moving. Some people do it by removing the starter motor and jamming a large screw driver against the flywheel. How did you reinstall the crankshaft pulley? What tools did you use? Depends on the mileage, age and condition of the seals after the timing belt cover has been removed. I4 engines start leaking from the seals at around 150K miles (i.e. camshaft, oil pump & crankshaft). But for some strange reason, the V6's don't leak. 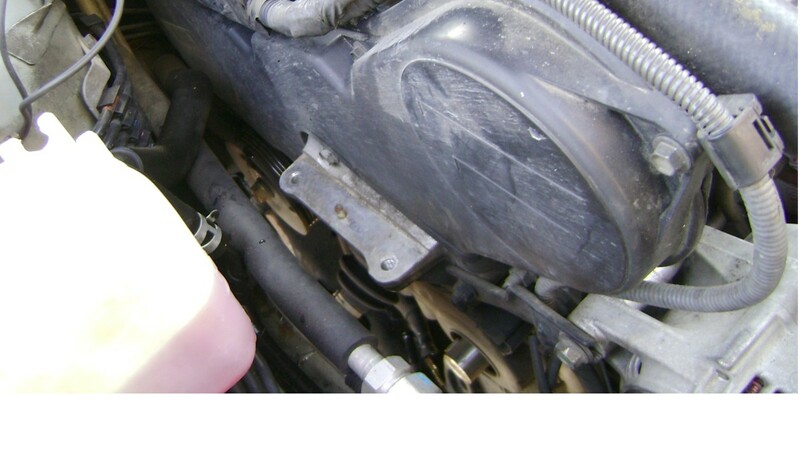 Even if there's a mild leak, switching to a Motor Oil for engines over 75K can swell the seal and stop the leakage. If over 200K miles, I'd replace the seals and the water pump. Did one recently on a Camry with 240K miles and the pump and seals were okay but didn't think they'd last another 100k miles. What you really have to worry about is the Valve Cover Gasket Bolts coming lose or the rubber cover gasket shrinking on the rear/firewall side bank. Have seen a lot of oil leakage out of V6's. Unfortunately, to replace the gasket, you'll have to remove the intake runners. If you're going to do it, might as well replace the plugs, ignition wires and have fuel injectors removed for professional cleaning. After replacing the gasket, apply thread lock on the Vale Cover Gasket Bolts. What is your opinion on replacing the other hardware during this process. Should I go after the oil seals? I love the detail of this post! Saves me from needing to buy the Factory Manual.